FileInMail automatically monitors one or more directories for specified files. 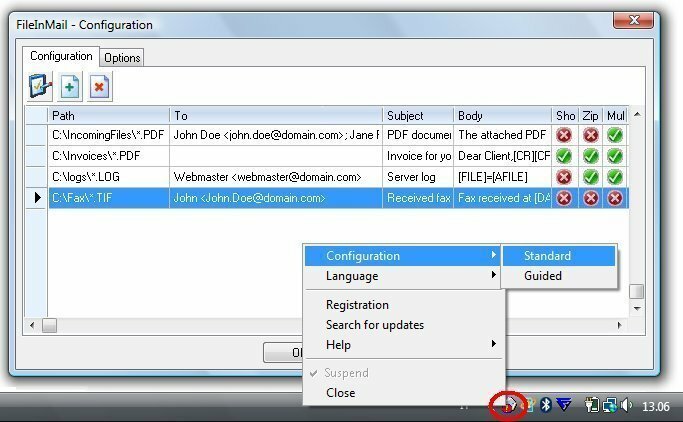 As soon as they appears, the files are archived on disk, even compressed as ZIP files, and forwarded via e-mail to one or more recipients through your own e-mail Client program or an SMTP server, with or without user intervention. Supported Clients are MS-Outlook or any standard MAPI e-mail client. No email client is required to send files via SMTP. Please contact us with the contact form to report difficulties, strange behaviors or persistent problems, and quote the program name or the number 20344 . This is the download page for FileInMail - FileInMail automatically monitors one or more directories for specified files. As soon as they appears, the files are archived on disk, eventually compressed as ZIP files, and forwarded via e-mail to one or more recipients through your own e-mail Client program or an SMTP server, with or without user intervention.